Ann Taylor Pom Pom Crinkle scarf* – Thanks to Skirt The Rules for enabling! Measurements: 32″chest, 28″ waist, 32″ total length (I forgot to take measurements before washing but these measurements are after washing on cold and air drying). Love and would recommend with some reservations. I love this dress (and will be letting go a similar J.Crew dupe in the near future) but I noticed that it shrank a bit in the length even though I didn’t wash it in hot water or dry it using heat. The lining now peeks out just the tiniest bit on the bottom hem but it’s not noticeable. Did anyone else have the same experience? I would recommend dry cleaning this dress for best results but according to Stylish Petite taking up the lining is an easy fix. *The scarf comes in bright yellow and black in stores since I noticed that all colors are no longer available online. Love and would recommend. As previously mentioned, I fell in love with the floral print and had to have this dress during LOFT’s last sale. The solid color is gorgeous too but I recently purchased this maxi from LOFT Outlet. Note that the open back (maybe it’s due to having a smaller bust) will accommodate larger busts easily but this design may make wearing a normal strapless bra a bit tricky. I may try adding one small, hidden snap button to keep the back flaps closed and I’m flexible enough to reach my back without any issues in order to button it. The side slit hits a little lower than mid-thigh on me. Measurements: 34″ chest, 42″ along the bottom hem, high-low style with front measuring 23″ total length and back measuring 26″ total length. Love and would recommend. Note that the back is sheer so a cami is required unless you don’t mind your bra strap showing. 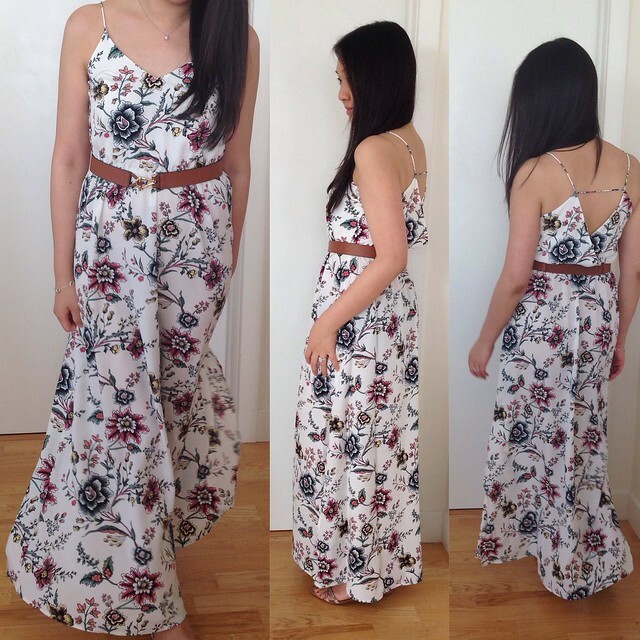 Strappy Maxi Dress – Is it wrong to want this dress in both colors? Pleated Sleeveless Dress – I purchased this white dress in regular XXS but shrank it to fit better (see it on me here). I just noticed that petites is now available online. See the navy version in PXXS on me here. Note that unlike the other colors the white version is lined so it is not see through. Scallop Cotton Eyelet Dress – Previous review here. Eyelet Sleeve Cardigan – Previous review here. Thanks Jasmine! I think it will shrink since mine did a little. Keep me posted! Otherwise you should hold onto yours in case you come across your size in stores. The dress runs big so some people may return it in stores in order to size down.Yes I do look at Zara. I am usually a size S in their blazers since they run small. The exact blazer you linked to will be on Stylish Petite's blog soon. She got it in size XS. I'm tempted to order it too since that was the exact blazer that caught my eye when it first came out. I haven't bought anything from Zara in a long time even though I use to shop there a lot and some of my most loved pieces are from them. Thank you so much! From what you said I guess size S should fit. Zara has free in store returns so when it doubt order both sizes? I really want the Frayed structured jacket in ivory. I saw the light green color on Respect the Shoes and it was so cute. The Frayed jacket is cute, get it Jess. I'm holding for a few more days and will order both sizes to try on.I don't have any Zara store near me but if I read correctly they accept free mail in return. I have no problem with that. I checked out the pinterest link in your email and wow for your research of wedding preparation. I also saw the Mikimoto pearl pendant necklace and found that they have it in yellow gold. Tiffany only has white gold. Yellow gold will match with my everyday ring and bracelet so I'm lean toward that. But I still trust Tiffany more. Do you have any experience with Mikimoto? Thanks Jasmine! I've seen both jackets in person but there were none in my size to try on in order to assess the fit. I've never returned in the mail so to be honest I'm not sure but I hope it is free returns via mail. 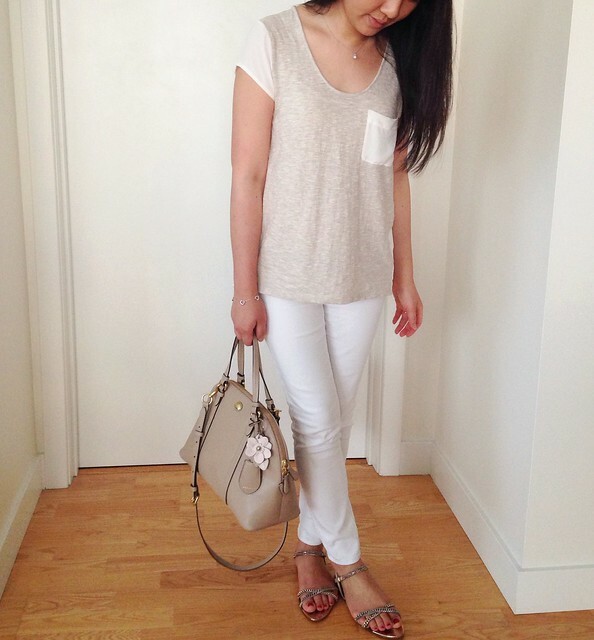 I used to have quite the Zara habit and had to quit. Their free overnight shipping (at least in the past and in my area) was such an enabler but I found that most of their clothes don't fit me as I'd like so I got tired of doing returns. I do not have any experience with Mikimoto (yet) but I have to say that Tiffany's customer service has been pretty convenient. They offer free cleanings for their fine jewelry pieces. They will also fix things for me free (e.g. the settings for pearl earrings need to be checked about once a year) or for a small charge. I've been pretty happy with the luster of my Tiffanys earrings and necklace. My pearls by the yard bracelet isn't as nice but that's because it uses cultured pearls and I would love to upgrade to the Mikimoto version instead. I know you don't like sterling but my open heart bracelet is my favorite piece as well and depending on which CS rep I get they've cleaned/polished it for me free of charge. Yes, Tiffany has a store very close to my home which i can come in to check things out before buying, also take advantage of the other services. Even Mikimoto does offer after sale services , I can't get those, no Miki store in my city. Anyway, there's no rush here, I have to work on savings, so plenty of time for me to think of. Will always keep in mind that your T&co necklace caught my eyes in the first place. Best!